Joel Allegretti was born and raised in New Jersey, where he still lives. His work has been anthologized and nominated for a Pushcart Prize. He was one of three writers selected to participate in the inaugural Visible Word, a collaboration of literary and visual artists sponsored by the DeBaun Center for the Performing Arts of Stevens Institute of Technology. He performs frequently as both poet and musician in the New York and New Jersey poetry scenes. 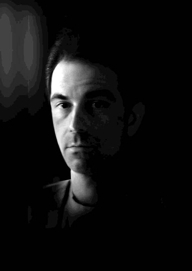 Most recently, Joel was editor of Rabbit Ears, an acclaimed anthology of television-themed poetry. amid the psalmody of flute-throated boys. as the fleas rouse themselves to feast. with the renunciation of grace. upon an abacus of gallstones. Thy Lord hath not forsaken thee nor doth He hate thee. for the hips of dancers. A pig grunting in the marketplace. And carried my echo to Egypt. Because their song could not compete. And dulled them against the rocks. And offered me his alms. And sweetened my linens at dusk. The way to my room. Before I sang for the Lord. that it consumes everyone who approaches it. She did not have to be beautiful. a soul that celebrated music. but not a Gounod aria or the Magnificat. the song of the day was a dirge. that it was only God spitting in her eye. the song of the day was an anthem. the song of the day was a tasnif. the whimsies of a bored king. like a petal torn from the pomegranate. May Allah guide and protect you. the song of the day was a requiem. with the full measure of your mastery. of a battered, battered heart. Who writhes in Hell, Erik? to match you for hopelessness? on which to lay the disgrace of flesh. Luminous with larks and comets. It resounds with sanctus bells. Can you hear the angels, Erik? this one last moment and listen. The choirs sing for you. Monsieur l'Ange de la Musique. Dormiez bien dans le berceau de l'eternite. Sleep well in the cradle of eternity. Here is one of the most startling books of poetry since Baudelaire. Joel Allegretti, author of The Plague Psalms, has been up to no good since his first book, and this new book goes darker and deeper still, delving into such delicate topics as The Juggernaut, Mother Julian of Norwich, Eurydice as Greta Garbo, Nico, spiders, the Gallows Tree, the horrors of 9/11, and "Billy the Whore: An Encomium in 9 Infections." 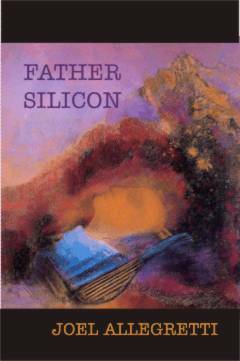 Father Silicon was picked by The Kansas City Star as one of the ten most notable poetry books of 2006. Published 2006; third printing 2009. 72 pages,6.5 x 10.25" ISBN 0-922558-18-3, $13.95. Joel Allegretti's dark and Gothic collection of poems, The Plague Psalms, has gone through two editions — a hand-bound edition, including some copies on exotic hand made papers (the black "Dominican" binding was popular, second only to the flesh-toned "human skin" binding) — followed by a deluxe hardcover binding done by Acme Bookbinding in Boston. A new, third, paperback edition has been issued, including all the color content from the original limited edition.